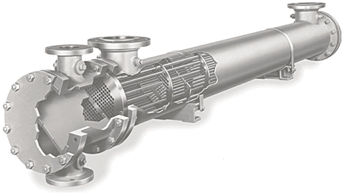 Most commons are shell-and-tubes or plate heat-exchangers. The shell and tube heat exchangers is configured as a bundle of tubes inside a shell. 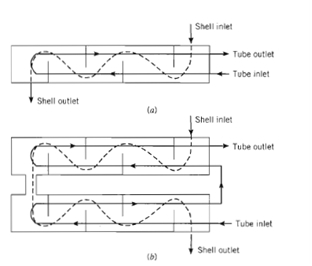 Specific forms differ according to the number of shell and tubes passes. Baffles are installed inside the shell to increase the convection coefficient and improve the heat transfer between fluids. The tubes are supported by the baffles and this way vibration due to the fluid circulation is reduced. 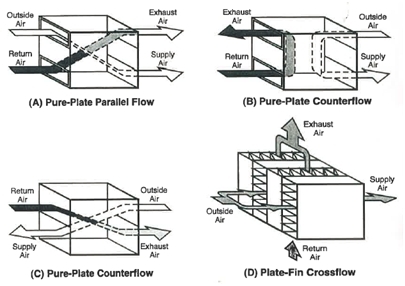 Plate heat exchangers are systems that separates two air flows with solid elements (plates). The heat exchange occurs through the plates, which can be built with fins to maximize the contact surface and increase the exchange efficiency. Depending on the flows direction the system will be parallel flows or countercurrent flows. The plate heat exchanger efficiency is around 75% . The installation of a heat exchanger does not implies a change in the process, because the main aim of the measure is to harness wasted fluid (and wasted energy) and pre-heat or pre-cool an incoming fluid to the process. Therefore, process can be kept identical, and the heat exchangers affects the fluid in an early stage and when it already has came out from the process.